Volvo India has finally launched the petrol variant of its popular crossover, V40 Cross Country. This trim is fitted with a 1.6-litre petrol engine under the hood, which comes with Gasoline Turbocharged Direct Injection for making it more efficient. It is christened as Volvo V40 Cross Country T4 and is cleverly mated with a six speed automatic transmission gear box, which helps in generating a maximum power of 180bhp in combination with a peak torque output of 240Nm. The braking and suspension mechanism are quite proficient, which helps in keeping the vehicle stable at all times. Its braking mechanism is further augmented by ABS along with electronic brake force distribution. It also has dynamic stability and traction control function for added safety. Apart from the engine, it is fitted with the same features, which are available in diesel variant. The company has given it an aerodynamic body structure, which is fitted with a lot of styling aspects. Its frontage has a bold radiator grille with a large company insignia, body colored bumper, ORVMs with electrically adjustment function, a set of alloy wheels and many other such aspects. On the other hand, it has a spacious internal cabin, which is incorporated with a number of comfort and safety aspects. The list includes an automatic air conditioning unit, an advanced music system with various input options, park assist pilot along with rear view camera and sensors and many other such aspects. In addition to these, the car maker has blessed it with a lot of safety features, which protects the occupants as well as vehicle. It has dual front airbags for driver and front co-passenger along with passenger airbag cut off switch and side airbags. It also has energy absorbing frontal structure with side impact protection system that further adds to the safety quotient. To begin with the frontage, it is designed with a large radiator grille, which has a lot of chrome treatment on it. This grille is embedded with a prominent company logo in the center. It is flanked by a neatly crafted headlight cluster, which is incorporated with active bending lights (ABL) with motorized lamps that can turn up to fifteen degrees in any direction. This headlamp cluster also comes with dual xenon technology with low and high beam that adds to the safety. The body colored bumper has a wide air intake section, which is flanked by a couple of bright fog lamps. The large windscreen is made of green tinted glass and accompanied by a set of rain sensing wipers. Coming to its side profile, it is designed with body colored pull type door handles along with glossy black finished external wing mirrors. These mirrors are electrically adjustable and have been integrated with side turn blinkers. It has black finished window sill and B-pillar that gives the side profile a decent look. The pronounced wheel arches are fitted with a modish set of 17-inch Larenta alloy wheels, which have been further covered with robust tubeless radial tyres of size T 115/90 R16 92M and provides a superior grip on any road conditions. It also has a pair of roof rails in silver metal finish with black fleet and aerodynamically designed for maximum fuel efficiency. Its rear end is designed with a large windscreen, which is made of tinted glass and integrated with a wash and wipe function and a defogger as well. For enhancing the look of the vehicle, it has a sporty roof spoiler, which is integrated with a LED high mounted stop lamp. The body colored bumper is accompanied by aluminum finished skid plate, which prevents it from minor damages. It also has dual end pipes that are finished in chrome. The curvy boot lid is embossed with variant badging and a thick chrome strip. Its luminous tail light cluster is equipped with high intensity reverse lights and turn indicator. The spacious interiors of this Volvo V40 Cross Country T4 variant is designed black color scheme and incorporated with a number of sophisticated features. The interiors are further complimented by ambient lighting. The cabin is incorporated with ergonomically designed seats, which are very comfortable and provides ample leg space and shoulder room. Its front seats can be adjusted electrically and has proper lumbar support. These are integrated with adjustable head restraints and covered with leather upholstery. Its rear seat has split foldable function, which helps in increasing the boot compartment. The dashboard is made of high quality plastic materials and are equipped with a large illuminated glove box with cooling effect, 3-spoke steering wheel with multi-functional switches, an instrument panel and chrome finished AC vents. Its digital instrument cluster comes with crystal TFT display that houses gear shift indicator, a low fuel warning light, trip computer, a digital tachometer, ambient temperature gauge and many other warnings and notifications for keeping the driver updated. The chrome finished inside door handles and gear shift knob along with leather wrapped steering wheel gives the interiors a classy look. Apart from these, it also has all four power windows with driver side auto down function, headlamp level adjuster on instrument panel, automatically dimmed internal rear view mirror with compass, speed limiter and cruise control, which maintains a steady speed on the highways as set by the driver. Under the bonnet, this variant is powered by a 1.6-litre petrol engine, which comes with a displacement capacity of 1596cc. It is integrated with four cylinders and sixteen valves using double overhead camshaft based valve configuration. With the help of gasoline turbocharged direct injection fuel supply system this vehicle generates 16 Kmpl approximately on the highways and about 12.5 Kmpl in the city traffic conditions. On the other hand, it is mated with a six speed automatic transmission gear box, which enables the motor to attain a top speed of 210 Kmph. At the same time, it can cross the speed barrier of 100 Kmph in close to 8.5 seconds from a standstill. This power plant can churn out a maximum power output of 180bhp in combination with a peak torque of 240Nm, which is quite good for this class. All its wheels are fitted with high quality disc brakes, which are further assisted by anti lock braking system along with hydraulic brake assist and ready alert brake system. Besides these, it has dynamic stability and traction control along with advanced stability control that helps to keep this vehicle under the control of driver. On the other hand, its front axle is assembled with a McPherson spring strut, whereas the rear axle is affixed with an advanced multi link type of mechanism. The automaker has blessed it with a highly responsive power assisted steering system that makes handling quite convenient. The cabin is integrated with a power steering system that is quite responsive and makes it easy to handle even in peak traffic conditions. 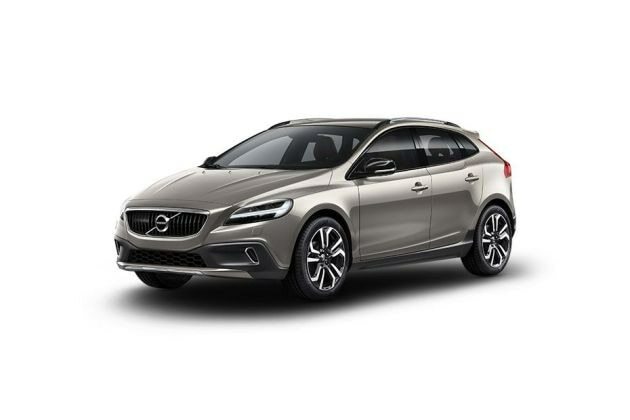 This Volvo V40 Cross Country T4 trim is incorporated with a long list of convenience aspects, which gives the occupants a comfortable driving experience. The company has blessed it with a 7-inch SENSUS color display, which supports adaptive cruise control, collision warning with full auto brake, pedestrian detection, driver alert control, lane keeping aid, radar blind spot information system, road sign information, climate control and lots of others. The cabin is incorporated with an advanced music system, which comes with Bluetooth connectivity and touchscreen display. The multifunctional steering wheel is mounted with audio, call and cruise control buttons that adds to the convenience of driver. It has an efficient air conditioning unit, which comes with dust and pollen filter. It also has interior air quality system that continuously monitors he incoming air. Apart from these, the company has given it front center armrest, heated windscreen, panoramic glass roof, clean zone interior package and a few other such aspects that helps in giving an enjoyable driving experience. The company has bestowed it with a lot of safety features, which gives a stress free driving experience. It is made of strong steel cage body structure that offers maximum security in the event of a collision. The front and rear crumple zones help to distribute the crash force and minimizes the impact on the occupants inside the vehicle. It is bestowed with an electronic engine immobilizer, which makes it impossible to start the vehicle without the right key and protects it from theft. Furthermore, it has city safety which can sense an impending collision at speeds of up to 50 Kmph and helps in preventing it. In addition to these, it also has dual stage front, side as well as knee airbags, safety belts with pyrotechnic pretensioners, power child safety locks, a remote controlled panic alarm using which, the hazard lights can be activated in an emergency, cross traffic alert with rear radar sensors, blind spot information system, whiplash protection system and so on. 1. Reliable engine performance with decent acceleration and pickup. 2. Attractive body structure with a lot of styling aspects. 2. Cost of ownership and spares are quite expensive.